I ordered some new stainless steel pans for myself after Christmas because I’m trying to get away from using anything with a nonstick coating that has the potential to release toxic chemicals in the food I prepare. I did some research on stainless steel pans and decided after reading many reviews to go with some Lindy’s pans. This pizza pan is amazing! 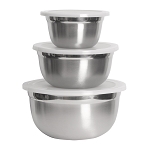 It is an excellent quality heavy duty pan that I will use over and over for years to come. I have not had any problems cleaning it. It’s such great size to use for so many things, not just pizza. I even used it to as a serving tray when making pancakes! I has never warped in the oven. I would definitely buy this again!